Kent-based animal behaviourist, Jackie Murphy A.Dip CBM MIfL (QTLS) can help your fearful dog. Specialist Dog Training has created a Fireworks Night, Babies and Children and Dog Show Preparation Pack CDs aimed at alleviating fear and anxiety experienced by dogs & cats. A qualified dog behaviourist, trainer and teacher, with over 40 qualifications in the field of animal behaviour and psychology, Jackie has put her specialist training to work to give owners a practical aid to prepare their pets for November 5th. All the Preparation Packs contains a specially created CD of noises, compiled by Jackie, which owners can play in short sessions during the daytime. This will introduce pets to the unfamiliar sounds of fireworks, Children or Dog Shows and help to build confidence. Puppies and kittens are particularly vulnerable as the experience will be new to them. The pack also contains instructions on how to use the CD. For more information on how Dog sound Cds can help your pet, check out our blog post. 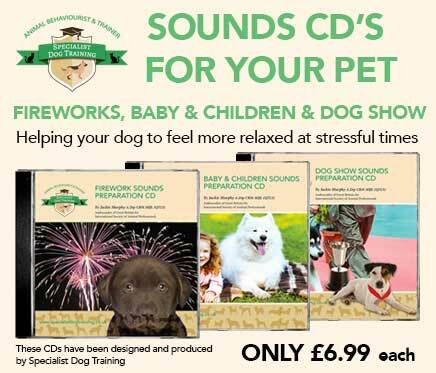 This CD contains a complete sound of a firework display to help prevent fear of fireworks in puppies and help those fearful dogs/puppies who have or are displaying anxious and scared behaviour around the firework season. Sounds include: real life display of different fireworks. This CD contains sounds of babies and young children to help get your puppy and/or your dog ready for a new baby or foster child(ren). This CD can also be helpful for dogs and puppies who do not come into regular contact with babies and children, preventing you form having a fearful dog. Sounds include: baby sounds, children laughing, children’s playgrounds, babies crying, etc. This CD is very unique as it a complete soundtrack of a dog show to help those dogs (and puppies) who are entering and competing at show level. It allows them to get used to various sounds that are associated with these events. Sounds include: music, dogs barking, tannoy systems, etc. These CDs have been designed and produced by Specialist Dog Training. Each CD has a running time of approximately 30 minutes. The CD‘s have been endorsed by ISAP (International Society of Animal Professionals). Jackie works with all ages and breeds of dogs, helping their owners to solve a variety of behavioural and training challenges. She works throughout the South East and is one of the UK’s leading experts in animal behaviour, using kind, non-invasive and humane training methods.